It is important to read information about dry ice safety and recommended safety guidelines. Dry ice is solid carbon dioxide - (CO2) it is very cold: -78ºC. It sublimes (turns from a solid) to a gas that is heavier than air. It is important to note that a little bit of dry ice will sublime to a large volume of gas. The following links provide guidelines on the safe use and storage of dry ice. Information on carbon dioxide and safety measures with handling and storage. Dry ice packs are supplied in quantities from 2.5kg. There are Government guidelines on lifting and moving boxes in particular if you are ordering pack sizes over 10kg. The link to the Government's HSE (Health and Safety Executive) may provide useful information. Safety and Usage instructions of Chillistick's dry ice supplied in insulated containers. For more information on how to order dry ice and the pack sizes we offer. Please visit our Dry Ice Information page. 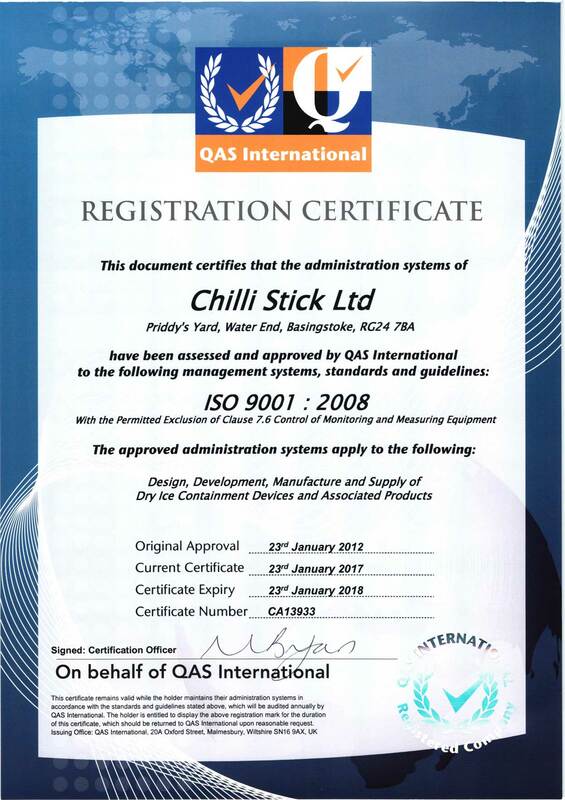 Any questions related to Chillistick products please see our our frequently asked questions or you can contact us on 020 3432 9412 and email info@chillistick.com.